The fame of Greece and its islands has spread all over the world as it is due not only to travel agencies but also to the tons of information and photos available online. Who hasn`t heard of the fascinating Greek islands, the stunning blue beaches, whitewashed houses and tasty food? Who hasn`t seen some of those idyllic photos with the blue-domed churches and seaside tavernas with wooden tables and chairs? And while some islands are still to be discovered by mass tourists, others received some help from famous movies shot there. 1. Skopelos and Mamma Mia! After Mamma Mia! was filmed in 2008, tourists rushed to discover the small island of the Sporades, no matter only some of the scenes were shot there (the other locations were Skiathos and Pelion). 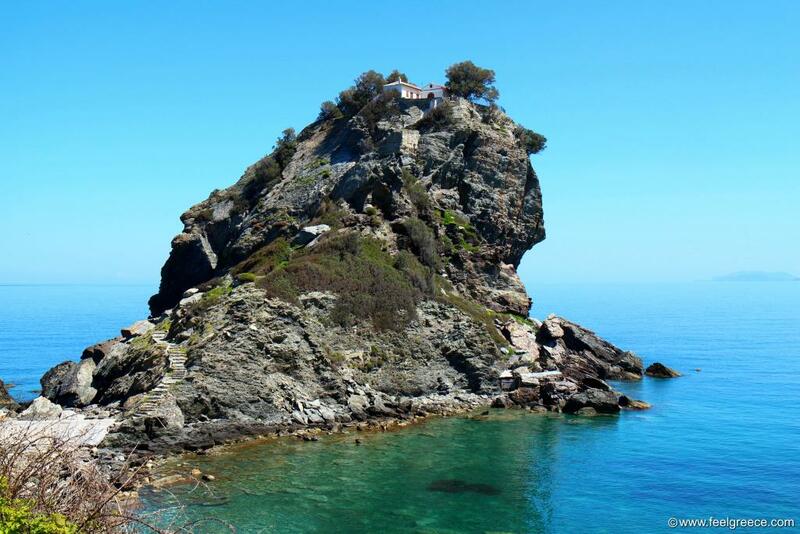 But these scenes show one of the most scenic places Skopelos can offer, and namely the church of Agios Ioannis perched on a rock above the sea. Many weddings have been organized in the church since then, and Kastani, the most beautiful beach of the island is now known as "the Mamma Mia beach". The Ionian island of Kefalonia experienced significant boost in tourism with the novel Captain Corelli`s Mandoline published in 1994. But the number of tourists have reached new heights since 2001 when the homonymous movie conquered the audience despite it received below the average score from critics. Some scenes include the awesome Myrtos beach which is now among the top ranked beaches of Greece. Luc Besson`s movie The Big Blue (1988) was shot on the Greek island of Amorgos where the color of the sea perfectly suits the title. Amorgos has not become as much popular as other islands of the Cyclades group but this drama movie definitely provoked interest, especially in the beaches of Agia Anna and Kalotaritissa where many scenes were shot. Before Zorba the Greek (1964), Stavros was completely unknown fishing harbor in the prefecture of Chania, Crete. If you have watched this movie, you definitely remember the last scene where Anthony Quinn dances syrtaki on the beach - well, this is the beach. Now Stavros is a small but well developed resort full of hotels. You cannot imagine that cosmopolitan party Mykonos was just one of the unknown Greek islands? When the movie Shirley Valentine was shot in 1989, it turned the eyes of British people to the small white island. The sandy beaches and the authentic Cycladic atmosphere did the rest and Mykonos gradually became a popular holiday destination. But a greater impetus of the island reputation came with The Bourne Identity launched in 2002 and the final scene shot there. Apart from Crete, Anthony Quinn is "responsible" for the popularization of one more Greek island - Rhodes. After filming The Guns of Navarone in 1961, Quinn was so captivated by the island that he bought an isolated bay on Rhodes where he intended to built a center for artists. The purchase however was later annulled by the Greek government, although they admitted the movie provoked great interest in the island and its historical legacy. The actor was deeply disappointed with this and never came back to Rhodes but the beach is still known as Anthony Quinn`s beach - it lies a bit south of Faliraki, in a pebbly cove with saturated blue water.